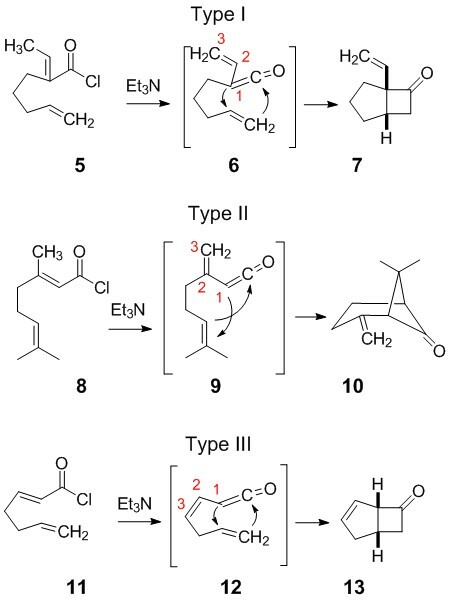 Intramolecular cycloadditions of α,β-unsaturated ketenes give more highly functionalized, synthetically useful products from simple precursors.85,88,89,100,101,107,108 These can be classified as type I, II or III depending on whether the tethered double bond is attached to carbons 1, 2 or 3 of the unsaturated ketenes. Furthermore deportation occurs selectively on the methyl group of 8 to give ketene 9 which cyclizes to β-pinene/chyrsanthenone precursor 10. Deprotonation of trans acid chloride 11 gives cis vinyl ketene 12 selectively.